Spiral Brushes Spiral brushes are surface treatment and cleaning tools characterized by their cylindrical shape and spiral bristle configuration. Spiral brushes are usually composed of twisted-in wire bristles, and the term "twisted-in wire brush" has become somewhat synonymous with spiral brushes. Used in a wide range of applications, different types of spiral brushes are made in different ways; twisted-in wire brushes feature bristles clamped and spiral twisted between folded wire. Wheel brushes have a solid circular base with radiating bristles. Twisted knot wheel brushes have metal bristles that are grouped together and twisted to increase abrasion. Coiled strip and cylinder brushes are cylindrical brushes with outward facing bristles. 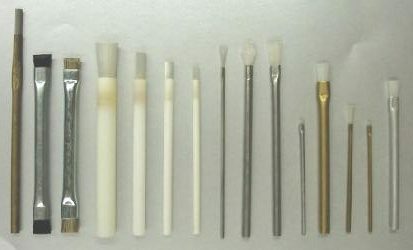 Each of these types of brushes is used to perform different cleaning, deburring, surface finishing and scrubbing functions during the industrial manufacturing process. 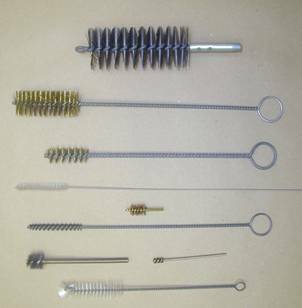 Twisted-in wire spiral brushes clean bottles, cans, fireplace flues, OEM machine parts, sockets, tubes and tube fittings, equipment parts and other parts. Other common applications include the cleaning of medical instrumentation and valve guides as well as deburring, polishing and swabbing. 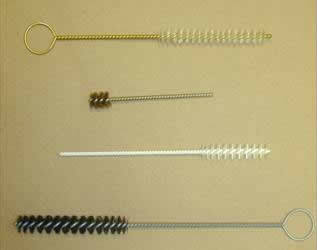 Twisted-in wire brushes are relatively easy and cost-effective to manufacture in comparison to some other brush types. Used mainly for cleaning, twisted-in wire brushes are made with nylon, polypropylene or abrasive bristles made of steel, aluminum or brass. Capable of being manufactured very small, twisted-in wire brushes perform cleaning and surfacing applications in tight places that could not be reached otherwise. Cylinder brushes, coiled strip brushes and wheel brushes are used frequently in conveyorized processing for cleaning, surface roughening, dusting, sorting, washing food products, lint brushing, static dissipation, pipe cleaning, textile felting and surface finishing. Spiral cylinder brushes can be self-cleaning and are ideal for removing undesirable particles from a moving web. Metal-bristled wheel brushes and twisted knot brushes are often used at high speeds for deburring or surfacing. Bristle material is always determined by the brush's intended application. Deburring process, for example, call for a tough metal material that won't wear down substantially upon contact with another metal. Conversely, a rough metal wire spiral brush might not be appropriate for some surface cleaning processes; this could cause unwanted scratching or abrasion.